After starting off as a great year, the market has soured on these solar stocks. Here's why these three investors think it's time to give them a closer look. Solar isn't like many other high-tech industries: It's wickedly, viciously cyclical. Many investors caught unawares of that reality have paid a dear price this year, as many solar stocks have taken a beating. This has been especially true since late spring, when some solar stocks were up, but they have generally fallen since. Simply put, the implementation of tariffs in the U.S. and China's move to slash its domestic solar incentives have left the world with a substantial overcapacity of solar production, and far weaker demand than anyone could have imagined a couple of years ago. But that doesn't mean investors should eschew solar completely. To the contrary, the best time to buy solar stocks is when the cycle has turned negative and investors are fleeing the space, so long as you do the research to understand what you're buying and have fortitude to hold what can be very volatile stocks. Furthermore, the industry is set for massive growth in the decades to come, and there will be some big winners. Three solar stocks in particular to watch right now are SolarEdge Technologies Inc. (NASDAQ:SEDG), TerraForm Power Inc. (NASDAQ:TERP), and SunPower Corporation (NASDAQ:SPWR). Keep reading to learn why these three Motley Fool contributors identified these solar companies as bright spots. 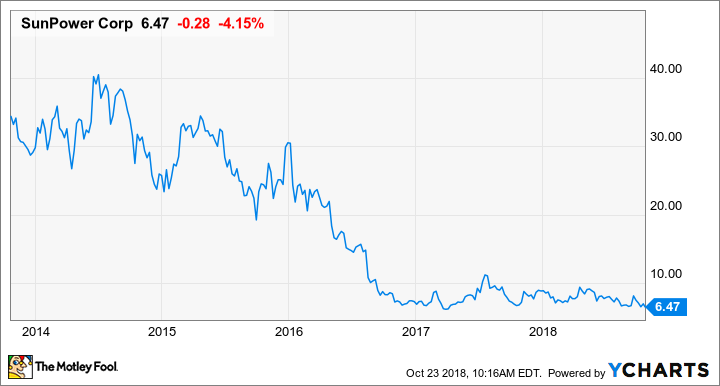 Rich Smith (SolarEdge): I don't know about you, but one solar stock that I have been watching -- in horror and disbelief -- these past few months is solar inverter maker SolarEdge. Don't get me wrong. SolarEdge has been a fantastic investment for me. It's up more than double from when I recommended it in 2016, and is beating the S&P 500's performance by more than 90 percentage points. That being said, SolarEdge has been a huge victim of Donald Trump's trade war against China -- and imports of Chinese solar panels in particular -- falling more than 40% from its high point in May 2018 through October's recent prices. Could Trump's trade war derail SolarEdge's growth thesis? It could. By now, though, Wall Street has to be aware of the effects of higher tariffs on solar panel demand, and you've got to expect they've built those risks into their expectations for SolarEdge's growth rate. If 22% is anywhere near the "right" number for SolarEdge, this stock is a bargain. Tyler Crowe (TerraForm Power): Yieldcos were supposed to be The Prince That Was Promised of the solar industry. They were designed to be high-yield investment opportunities that would own and operate renewable power assets and throw off loads of cash that was contracted under long-term power purchase agreements. Unfortunately, too many of them became dumping grounds for renewable power developers looking to monetize assets quickly and forcing those yieldcos to overpay for assets and loading them up with debt. TerraForm Power was once the dumping ground for its former parent, the now-bankrupt SunEdison. In SunEdison's bankruptcy proceedings, Brookfield Asset Management acquired the floundering yieldco, which is one of the reasons that investors should look hard at this high-yield stock today. Unlike other yieldcos that are tied to developers, Brookfield isn't looking to dropdown assets at questionable valuations. Instead, it treats TerraForm more like a managed portfolio of investments. If it can acquire new projects at good valuations, it will buy. If someone is willing to pay a premium for something in its portfolio, it will sell. And, most importantly, it will develop projects using internally funded cash. Brookfield has a great track record of managing a portfolio of assets in its other subsidiaries, and it is now applying that same playbook to TerraForm Power. It thinks it can achieve 5%-8% distribution per share growth and a moderate yield to produce annualized returns in the low to mid-teens. That may not be the hypergrowth some expect from a fast-growing industry like solar, but it is a great way to grow wealth over time. Jason Hall (SunPower): My colleague Tyler raises some very valid concerns about high-tech panel maker SunPower: Despite consistently leading the industry in panel efficiency, the company has struggled to find an effective go-to-market strategy to make the most of that advantage. And that's proven to be a major source of underperformance for its investors over the past few years, as the company has regularly spent more cash than it could generate. Plain and simple, that's why the company has over $1 billion in debt and why energy giant Total owns a controlling stake, having bailed the company out of dire financial straits on more than one occasion. Yet I continue to get drawn back to the company, because its panels are some of the best available, and I think the spate of consolidation we are seeing in the sector, should help it to finally reach at least some of its potential. And that's moving it up higher on my watchlist despite my concerns about its struggles to turn into the company it should be. Lastly, SunPower got a big gift from the Trump administration about a month ago, when its imported panels were excluded from tariffs enacted earlier this year. That should be worth at least $100 million to its bottom line over the next year and potentially even more if it can grow U.S. residential sales.